Equipment is another issue that many newly qualified divers want to know more about either during or after their PADI Open Water Course. ‘What do I need, and what order should I buy it in?’ is the usual format for this question. And the answer to this varies from diver to diver. It all depends on how deeply the diving bug has bitten you, how frequently do you think you might dive and the overall balance of your personal income and expenditure. There are many advantages to owning your own dive equipment. Familiarity with a personal set of scuba gear means greater comfort and a better dive experience. More importantly, it can help you avoid an emergency situation. From a safety perspective, owning your own gear ensures you know how to manipulate it in an emergency – ditching weights for example. In fact being familiar with your equipment can help to avoid getting into an emergency situation in the first place, so get to know your gear: practice adjusting it and ask your PADI Instructor for recommendations. By consistently diving with the same equipment you’ll learn how things are “supposed” to feel which will also help you dial in scuba skills such as buoyancy. It will also make your diving more comfortable and safe – which all leads to more fun in the water! If you know that you have fallen in love with diving, that you can’t wait for your next experience and you have plenty of leisure dollars then the short answer is to buy the lot now! But given that this is not an option for many people, let’s try and break it down a bit. If you frequently dive with the same buddy, and you both have your own equipment, the benefits really start to kick in. By knowing your buddy’s equipment, you’ll be better prepared to deal with an unexpected problem. Consider an out of air situation: when seconds matter you’ll want to know whether to go for a yellow second stage, or if your buddy will give you his primary while breathing off a secondary located on his inflator. Another common problem is a readjusting a tank that’s slipped; knowing your buddy’s buckles and releases makes this a lot easier to fix in the water. So firstly you should look at fins, masks and wet suits. Masks are small, light, and do not need to be overly expensive. There is nothing more irritating than blowing water out of your mask all dive, so a good comfortable fit is critical. Please remember that masks should not feel ‘clamped’ to you face! The pressure of the water holds it there once you are in, so don’t over tighten the strap, and remember to keep the strap from rubbing your ears! Fins are a bit trickier. Most regular divers go for slip on fins and booties, and in my opinion this is the way to go. The downside is that they are bulkier, heavier and in most cases more expensive than full fit fills. These are generally smaller and lighter so they might suit the backpacker and occasional diver better. If like me, they cause you to get blisters, try wearing a pair of socks! Wet suites are generally available to rent from dive outlets, but if you have a non-standard body size, you might be better off buying your own. 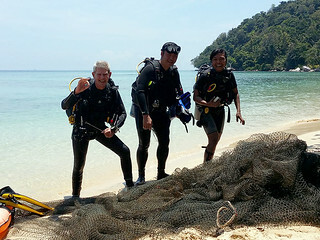 And if you are planning to dive in Asia, remember that ‘standard’ sizes here are generally a bit small for Westerners! The materials used are becoming more sophisticated every year. I recently bought myself a new full length 3 mm wet suit, while in the past I have always used a 5 mm wet suite. The new 3mm kit is at least as warm as my old 5 mm, and also incredibly buoyant because of it’s thermal lining. When buying a wet suit the first issue you need to answer is how thick the material needs to be. You could turn that question on its head by considering the water temperature that you anticipate diving in. For tropical diving a 3mm shorty or full length is enough. Temperate waters need 5mm or more, while cold water diving can be however much you need – though generally the answer to this is a dry suit. If you are not too sure what temperatures you might want to dive in, I would recommend that you buy a 3mm full length, then you can add on a hood, gloves, a rash vest, or even a shorty to be worn over the full length. Those plus booties will give you the flexibility to comfortably dive in a good range of water temperatures! 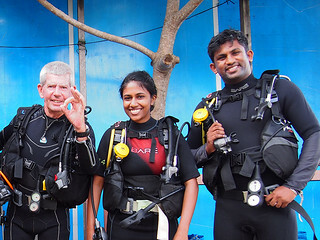 BCDs and regulators are usually bought a bit later in a diver’s career. There is a huge choice in both these pieces of equipment. The issues of size and weight are critical if you hope to travel overseas, and who doesn’t, so these are important factors when making your choice. The vast majority of regulators built these days are fine for recreational diving, and that includes the recreational use of Nitrox, so there is no need to go to the best in line unless you want to. As a very general shopping guide, I tend to buy last years ‘best’. That way you know that what you get will be good, without paying the premium of this years must have bit of kit! Dive computers are a major factor in diver safety and the vast majority of regular divers use them. If you have just passed your Open Water, you know how to use your tables, and why you should use them. However, the truth of the matter is that it is extremely rare to see divers on a boat using them. Most leisure divers who don’t have their own computer rely on the dive guide to keep them safe. In good conscience I have to accept that in the vast majority of cases this works, but there is no way I can recommend this as good diving practice. So my advice is to get one as soon as your budget allows. 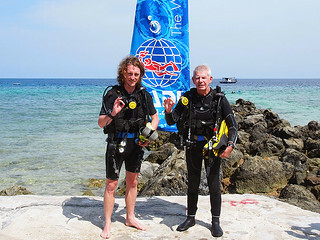 The Open Water certificate permits you to make dives independently from a dive professional. If you intend to do this then make sure you are properly equipped. While we are looking at equipment don’t forget the little stuff. Things like tank bangers, torch, compass and an inflatable surface marker buoy are all good buys. While I don’t normally carry a torch, I wouldn’t get in the water without the other three! Good luck with the shopping, and get wet soon!